The Crew: Jim Heumann and Karen Sullivan are a couple of recent retirees (him: IBM; her: US Fish and Wildlife Service) who met at a Puget Sound sailing rendezvous in 2007 and discovered they each owned identical sailboats, loved rowing, loved folk music, loved casseroles, and had enough yadda yadda yadda in common to make Match Dot Com belch. But there are plenty of differences, too. For example, they don’t always agree on when to reef. He likes sci-fi and beer. She likes literature and Bordeaux. There is enough room on the boat for lots of beer, or lots of Bordeaux, or lots of books, but not lots of beer, Bordeaux and books. 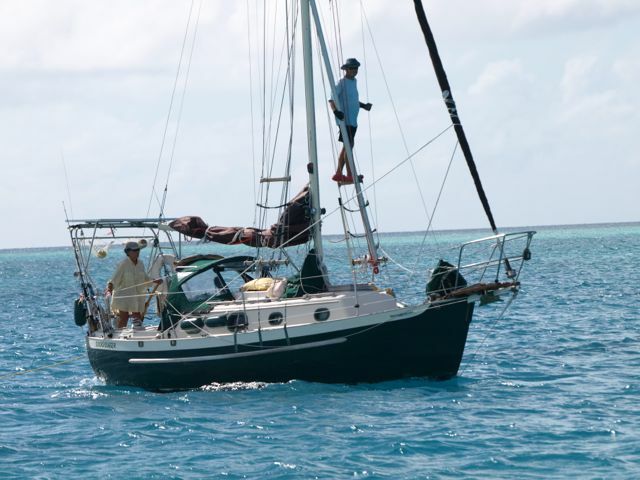 The Boat: A 1987 Pacific Seacraft Dana 24 named Sockdolager (pronounced Sock-DOLL-a-jur). The name came from an old 1800s word no longer in use, meaning something really outstanding, as in a knockout, as in "That was a real sockdolager!" Sockdolager Rapids in the Grand Canyon is also a real knockout, and Jim, being a whitewater rafter, liked the name. Of course it means we were forever explaining this to baffled strangers. For specs and descriptions on a Dana 24, Google it or start at: http://www.48north.com/mar_2004/dana24.htm and http://www.seacraft.com/Dana24.htm A little background: Karen had bought her own Dana, Minstrel, in 2001, after test-sailing one to see if anything that cute could actually sail out of its own way. She was shocked to find that it was faster than a 21-foot waterline had any right to be, beating out boats with waterlines 5-10 feet longer. She promptly sailed it up to Prince Wiliam Sound and Seward, Alaska, where she cruised it for 5 years. In 2005 (before they met), Jim researched the market thoroughly, looking for the highest quality boat that was easy for a novice to sail and maneuver. He found his Dana on the Great Lakes, named her Sockdolager, and had her shipped to Puget Sound. He’s a novice no more, and he’s more convinced than ever that the Dana is the right boat. It didn't make sense to keep two boats anymore, and upgrades on Sockdolager were well along, so in April 2010 Karen sold Minstrel. Sockdolager, much souped-up, is the boat we took on this voyage. The Voyage: In the spirit of testing the limits of the theory that there is no such thing as having too much fun, we have decided to go sailing around in this still-beautiful blue planet for as long as it’s fun, which we hope is a long time. Departing on July 9, 2011 from Port Townsend, we sailed down the west coast of the US to Mexico, where we wintered in the Sea of Cortez. 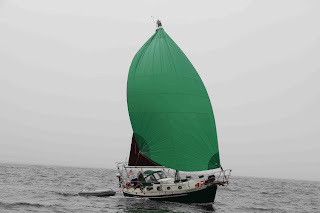 In March 2012 we headed out from Cabo San Lucas to cross the Pacific. 37 days later we arrived in the Marquesas, and spent the next few months cruising through French Polynesia. Leaving Bora Bora, we called at Aitutaki in the Cook Islands, and liked it so much we spent a month in its protected but shallow lagoon. 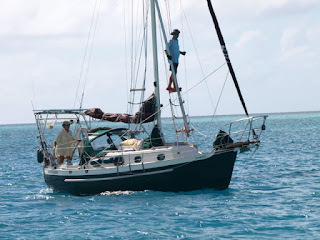 From Aitutaki we sailed to Palmerston but couldn't stop because of weather, so we continued on to Niue, and then Tonga. After an episode where Karen spent time in the hospital there due to a minor heart issue, Jim and his friend Tom Reese sailed Sockdolager to New Zealand, arriving December 8, 2012. After cruising and touring New Zealand, we put the boat on a container ship in May 2013, boarded the same ship as passengers, and shipped ourselves to San Francisco, where we re-rigged and sailed her the last 800 miles home, arriving in August. Update, autumn 2016: Sockdolager has been sold to her new owners, and we plan to cruise Raven, our wooden BigFoot 29 (a powerboat) into wild places to the north. 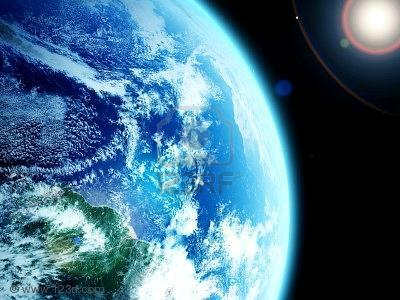 We will still keep in touch from far-flung and near-flung places via this blog. (Isn’t that fun to say: bloooog. Sounds like the sound made by a green Swamp Thing.) It's good to follow your dream while you can. Got updates? If you would like to be added to our email updates list for future adventures, or you just want to get in touch with us, you can use this address: karenandjimsexcellentadventure followed by the symbol for "at" followed by gmail dot com.